Benefit from proven techniques for effective interviewing, creating positive media relationships, and responding proactively, even in hostile situations. 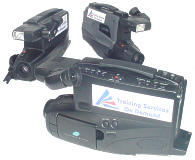 Practice proven techniques through videotaped interviews and realistic demonstrations. Learn the motivations and methods of the media, empowering you to position yourself as a persuasive media presence. Discover how to look and sound your best, leveraging nonverbal persuaders to boost your credibility. You’ll hear from experienced journalists whose careers evolved into public relations and politics… people who knew the media inside out before going to the “other side of the camera.” You’ll benefit from the techniques they’ve catalogued for dealing with various types of media encounters, from friendly interviews through crisis situations. And our facilitators aren’t novices in the workshop environment. You’ll benefit from their years of experience in creating and facilitating effective education programs for corporations and universities. MediaSavvy Workshops include videotaped practice interviews. Through these realistic exercises, you’ll find yourself in the line of fire. You’ll field questions from an experienced television reporter as the camera rolls. And you’ll discover how well you handled the situation through video playback critiques. The interviews—and playback critiques—are conducted in a full-class setting, ensuring that you’ll gain the full benefit of other participants’ experiences. To ensure the full participation of each person, MediaSavvy workshops are limited to twelve persons. MediaSavvy Workshops aren’t open to the public: They’re conducted at your location, for your team. We’ll work with you to emphasize your needs and your industry. We’ll help you standardize your approach to media situations so that you can maintain a consistent, on-point message. 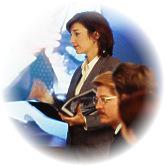 You’ll gain strategic results that aren’t available through itinerant training seminars. You’ll learn the processes through which ideas and events become news stories. This eye-opening, behind-the-scenes look at the news media helps you understand reporters’ needs, wants, expectations, and limitations. You’ll get a confidential tour of newsroom operations that helps you understand how reporters and editors do their jobs. This baseline discussion prepares you to create credible, influential relationships with the news media. You’ll benefit from our trademarked stop/go matrix that helps you decide how to handle each media situation you might encounter. Should you open the vault, crack a window, or bar the doors of information? This decision isn’t easy, and getting it right is critical. This session simplifies the tactical decisions you’ll need to make in every high-visibility situation. Along the way, you’ll discover ways to avoid appearing deceptive, even in situations where comments can’t be made. You’ll learn a guaranteed method for getting your perspective in print or on the air. You’ll discover that sound bites aren’t measured in time alone, and you’ll find out which words, phrases, and verbal techniques guarantee positive positioning in news stories. In addition, you’ll revisit reporter motivations to help you bracket your interview expectations and more fully prepare for your interviews. You’ll benefit from new research into gestures, body language, clothing, and facial expressions. You’ll discover easy ways to impress your audience through essential nonverbal cues. You’ll find out which gestures implant a subliminal message of hostility, aggressiveness, and even violence, and how you and use your physical presence to reinforce a reassuring and believable message. These nonverbal influences account for as must as 70 percent of television perceptions, and you’ll discover techniques for capturing that 70% advantage. You’ll learn proven methods for handling challenging interviews, including some techniques absolutely unique to this workshop. You’ll find-out why the old spin technique is best described as “old,” and how to replace spinning with recovery methods that reporters haven’t yet learned to counteract. You’ll gain the ability to grade the aggressiveness of a question on an intellectual level, allowing you to forge answers that preserve your credibility. And you’ll learn how to swat-away overly aggressive questions in a way that’ll never be reported. In this section, you’ll learn how to deal with inaccurate reporting. More importantly, you’ll learn how to ensure that no bridges are burned-that future encounters with the same reporter reflect your commitment to positive media relationships. There are ways to establish friendly, productive relationships with journalists, but there are also ground rules. We’re put these previously unwritten rules on paper, giving you the ability to advance yourself as a knowledgeable, credible friend of the media. You’ll gain insights that ensure a more positive, productive relationship with your media contacts for years to come.